In the lead up to Carlow Art Festival in 2015, a group of artists came together under the banner of Pure Thinking community for a project with a very special theme. 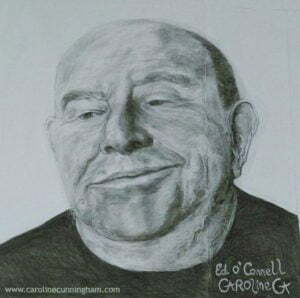 They set about drawing larger than life portraits of their chosen inspirational Carlow people for display on the exterior panels of Carlow Post Office. The project was completed in time for the opening ceremonies of the Carlow Arts Festival. Connie Byrne, founder and creative director of Pure Thinking initiated this project which brought together an eclectic mix of Carlow based artists. A total of four workshops were facilitated by the talented artist Iwona Nartowska O’Reilly and took place in Deighton Hall. Twenty-nine artists took part in the project, each creating a portrait in up-scaled version (80x80cm) of their chosen inspirational person. 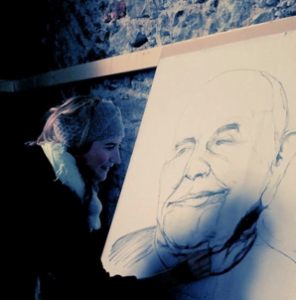 The portraits of the group reflected a vibrant Carlow community with a special-olympics athlete, an actor, an artist, historical figures, loved one’s who passed away and kindred spirit’s showing others how to enjoy life to the full. I chose a local artist and neighbour who according to himself is now an ‘octo-geranium’. Ed O’Connell retired from a teaching career in Carlow Regional College (now Carlow IT) having taught and introduced the course on ‘Industrial Instrumentation’. He is a light-hearted individual who enjoys singing, playing music, fishing, gardening and painting despite the difficulties of arthritis of the hands and feet upon other ailments. He continues to enjoy life and has many friends in his community. The atmosphere in Deighton Hall during the project was industrious and refreshing. I made wonderful new friends and found new opportunities to display my talents alongside these fantastic Carlow artists. Local photographer Michael ‘Spudy’ Murphy was on hand to document our work and capture us in both in deep concentration and having fun. The finished portraits were prepared for the panels of the Post Office building. Personally, this project has opened doors for me. It gave me the opportunity to go beyond limits to create my best portrait, up to that point, thanks to Iwona’s encouragement and demonstration.